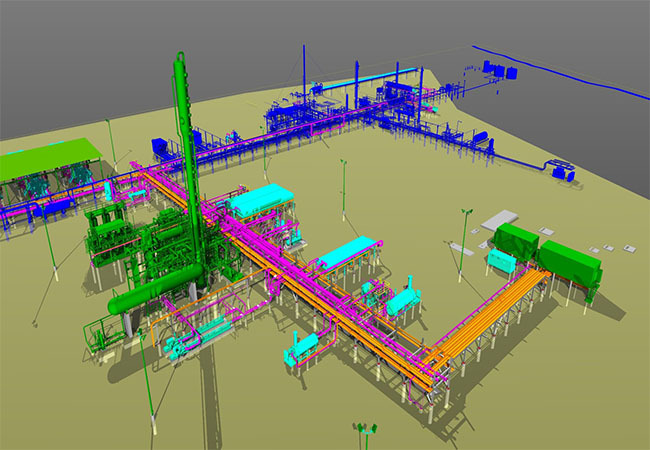 LOCATION: Reeves County, Texas, U.S.A.
SNC Lavalin awarded F&C Engineers the design of a 120MMSCFD Gas Processing Cryogenic Plant along with Separation, Processing and Storage of NGLs for installation in west Texas. This plant was integrated into their existing plant. This Cryogenic Gas Processing Plant is composed of a Standard 120MM Standard SNC Plant plus essential equipment listed below. Equipment Includes: Finger Type Slug Catcher, Inlet Separator, Stabilizer, Overhead Compression, Molecular Sieve Dehydration, Molecular Sieve Regeneration, Mechanical Refrigeration System, Cold Separator, Cryo Unit, Turbo Expander/Compressor, Hot Oil System, Residue Compression, MCC, Utilities, Flare Knock-Out Skid, Flare.